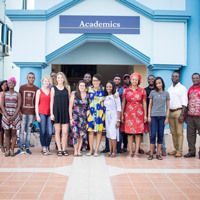 New students in Ghana include several from across West Africa and three students in the Global MA in International Relations program from the United States (2) and Austria (1). 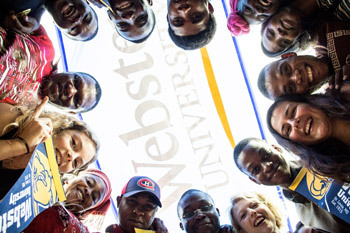 Webster University's campus in Accra, Ghana, welcomed new students from across the West African sub-region and beyond to add to its diverse student base for Spring 2017. Students participating in spring New Student Orientation were drawn from Ghana, Togo, Nigeria, Cote d’Ivoire, Congo-Brazzaville, DRC, and Mali. The campus also welcomed two students from the United States and one from Austria who are part of Webster's Global Master of Arts in International Relations program. The Global MA students will be spending the spring 1 term in Ghana. Right away, students from English-speaking countries in West Africa are learning from their French speaking counterparts, and vice versa, and campus staff report the synergy has been wonderful. Webster's Global MA in International Relations program. Speaking during New Student Orientation, campus director Christa Sanders provided an overview of the opportunities, diversity, global perspectives and study abroad options that are available for the Webster University students. She encouraged the new students to take advantage of the endless opportunities at Webster, and to become the agents for change that the world wants them to be. Holly Hubenschmidt, head of Instruction & Liaison Services at Webster University’s Library in St. Louis, also came to Ghana for a working visit. She took students, faculty and staff through the many library resources available globally as well as the step by step process in using Connections. Students were also provided with a neighborhood guide and also had the opportunity to embark on a day tour to explore their new city.